Sizzle in the heat with lips of a summer siren! Be the most kissable on the summer shores with this hot hue that makes your lips say it all! This Happy Skin Shut Up & Kiss Me Moisturizing Lippie is sure to help you make that smackin’ statement. This lip-loving moisture stick is loaded with Shea Butter and Collagen to get fans to line up for a taste of those supple, hydrated, and ultra-kissable lips. Highly pigmented and moisture-packed, this lippie glides on irresistibly smooth (without the stickiness!) and leaves behind a rich, creamy pout that’s way tempting to kiss. These lippies offer three-fold “lip service”: the shine of a gloss, the pigment of a lipstick, and hydration of a balm! Spoil yourself with Shea Butter & Collagen to keep your lips in lip-lockin’ shape! Lucky enough I was able to grab the chance to try a full sized sample. It was included for July list of samples from Sample Room for only 250 points. 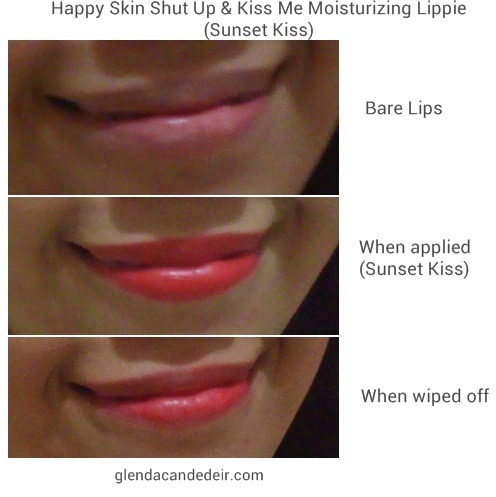 4 comments on "Review: Happy Skin Shut Up & Kiss Me Moisturizing Lippie (Sunset Kiss)"